Nashville is home to a ton of great theatre groups. And there is no better time to see a show than during the holiday season. There are so many choices! From Broadway style musical productions to small community plays, you are sure to find something your family will enjoy. Plan a date night or a family outing. And if you are having out of town guests, a night at the theatre can be a great way to show off our hometown talent. Make plans in advance as lots of these production will sell out early. In a kingdom beneath the sea, King Triton’s youngest daughter Ariel yearns to have her questions answered about the human world. When she saves the handsome Prince Eric from drowning, Ariel begins to discover her own voice with the help of her friends – even after the tricky sea witch silences her. Based on one of Hans Christian Andersen’s most beloved fairy tales, this classic will be given its own dose of NCT magic. Want to join one of NCT’s Special SHELLEBRATION PARTIES over Thanksgiving weekend? Learn More. Schedule and online tickets available at this link. This holiday season, discover the perfect gift for everyone on your list! Start with a timeless tale of joy and goodwill, fill it with classic Irving Berlin songs, top it off with glorious dancing and lots of snow and come see Irving Berlin’s White Christmas! It’s a must-see classic in a lavish musical that The New York Times says to “put on your wish list.” Irving Berlin’s White Christmas tells the story of a song-and-dance team putting on a show in a magical Vermont inn and falling for a stunning sister act in the process. Full of dancing, laughter, and some of the greatest songs ever written! Give everyone the gift they’re dreaming of with this merry and bright holiday musical. Order tickets online using this link. Tickets are $12 and may be purchased at this link. Based on the beloved holiday film, this fish-out-of-water comedy follows Buddy the Elf in his quest to find his true identity. Show schedule and tickets at this link. Director Neil Goldberg’s Cirque Dreams Holidaze will again delight audiences during 50 unforgettable performances including new and astonishing acts, colossal costumes, grand music and an encore of memorable signature favorites. This critically-acclaimed Broadway Musical, New Cirque Adventure and Family Show is the perfect holiday gift wrapped in one! Performance schedule at this link. Buy tickets online at this link. This new dramatization of C.S. Lewis’ classic, set in the land of Narnia, faithfully recreates the magic and mystery of Aslan, the great lion, his struggle with the White Witch, and the adventures of four children who inadvertently wander from an old wardrobe into the exciting, never-to-be-forgotten Narnia. The intense action features chases, duels and escapes as the witch is determined to keep Narnia in her possession and to end the reign of Aslan. All the memorable episodes from the story are represented in this exciting dramatization: the temptation of Edmund by the witch, the slaying of the evil wolf by Peter, the witnessing of Aslan’s resurrection by Susan and Lucy, the crowing of the four new rulers of Narnia, and more. The supporting characters are also here: the unicorn, the centaur and other forest animals, along with Father Christmas, Mr. and Mrs. Beaver and Tumnus the Faun. This story of love, faith, courage and giving, with its triumph of good over evil, is a true celebration of life. Easily staged, the play may be presented without intermission or in two short acts if desired. Tickets may be ordered online using this link. Ralphie’s back – for the tenth and final year! In celebration of this Nashville holiday tradition, Nashville Rep gives fans what they want – a hilarious, interactive winter treat. With a coveted BB gun, a ballet tribute to an iconic Leg Lamp, and a visit with Santa gone awry, the show more than delivers on its promise of laughs and heart-warming charm. Have your Little Orphan Annie decoder pins at the ready! The content of the show is appropriate for all audiences. However, the length of the production (2.5 hours) may be inappropriate for younger audiences. Recommended for ages 10 and up. Tickets and showtimes available at this link. Don’t miss your chance at seeing another flawless Audience of One production! For many of us, Christmas isn’t Christmas without the opportunity to see some form of this beloved story, but how to keep it fresh? For the first time we present this live 1940s radio broadcast version of the Dickens classic, in which a small group of actors brings the story to life complete with vintage commercials, live sound effects, and musical underscoring to lead Scrooge through his journey of discovering the true meaning of Christmas and of life. Tickets go on sale on November 19 at 10AM. Make plans because these sell out quickly! Tickets are $18 for adults, $12 for students (through high school), and $16 for seniors (60 and older). Doors open thirty minutes prior to curtain time. All seating is general admission. Curtain times are 7:30 PM for evening performances and 2:30 PM for Sunday matinees. Show runs from November 30 – December 15. Specific Dates/times at this link. Single mother, Doris Walker, doesn’t want her six-year-old Susan’s head filled with romantic notions. Their neighbor, Fred Gailey, tries to woo Doris by charming Susan and taking her to see Santa Claus at Macy’s, where Doris works. Doris is not impressed, but when it turns out that Macy’s Santa may, in fact, be the real Kris Kringle, a wave of love spreads across New York City that melts even the most cynical hearts. Rated G.
Tickets and schedule at this link. The Renaissance Players are a community theatre troupe. With more than 400 members, the Players present productions each year that include popular musicals and plays. Shows are cast through open auditions and performances are presented in Dickson, Tennessee. The Renaissance Players provides Middle Tennesseans with an opportunity to present productions comparable to most professional theatre companies. Tickets are $15 for adults, $10 for seniors and students and $5 for children under 6. Tickets may be purchased online at this link. Anyone who saw last year’s Smoke on the Mountain will no doubt be eager for the return of the Sanders family to the Mount Pleasant Baptist Church. Will Rev. Oglethorpe pop the question to June? Has Vera taught anymore Sunday School lessons with bugs? Which of the twins turn is it to go to Bible School? It’s Christmas, the stories will be engaging, the music will be entertaining, and you will be so glad you came and brought the whole family for this delightful holiday treat. You’ve seen it as an animated classic, you’ve loved it as a live-action film, and this season you’ll be wholly enchanted by Studio Tenn’s trademark eye-popping spin on Disney’s “tale as old as time.” Bring the whole family to Franklin for the holiday’s most magical outing, and delight in the adventures of Belle and the Beast as they discover the true meaning of beauty. Performance schedule and online ticket sales at this link. It’s Christmas Eve, and a young newspaper reporter on the brink of being fired has been assigned a last-chance story about a typical family Christmas – his family’s Christmas. He goes home to his recently widowed mother, his crazy uncle, his eccentric grandmother, and his battling siblings and their neurotic spouses, who provide no shortage of material. One by one, we learn each family member’s secrets, problems, and dysfunctions, and when they learn that he’s writing an article with some very personal family information, the fruitcake hits the fan. The question is, will the magic of Christmas bring this family back together? Opens Friday December 7 and runs weekends through December 16. Tickets are $15 and can be purchased through this link. 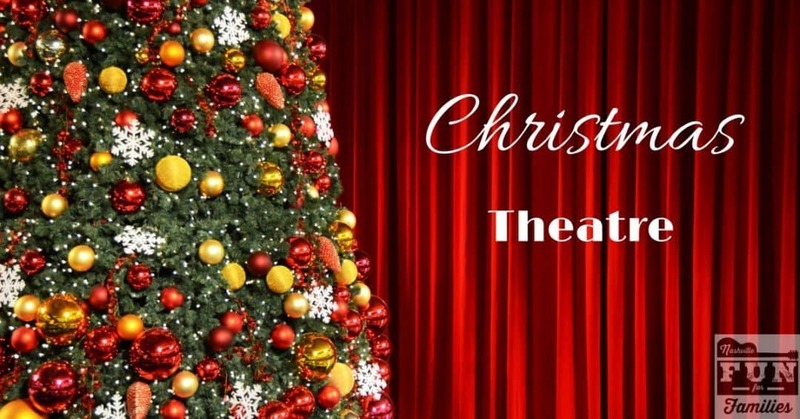 ​Instead of performing Charles Dickens’ beloved holiday classic for the umpteenth time, three actors decide to perform every Christmas story ever told — plus Christmas traditions from around the world, seasonal icons from ancient times to topical pop-culture, and every carol ever sung. A madcap romp through the holiday season! Show Dates/Times/Tickets at this link. This singing, swashbuckling adventure is performed in the high-flying style of a British holiday panto. Take off on a wild quest with Tinker Bell, Wendy, and Peter Pan at TPAC as they try to put a stop to the plot of some dastardly pirates who plan to kidnap Peter as a present to Captain Hook. Filled with big laughs, magic, dancers, and contemporary songs by everyone from Taylor Swift to the Bee Gees, this family show has a little bit of something for everyone. The talented cast is set to include John O’Hurley (Seinfeld) as Captain Hook. Known for their creativity and involvement in television hits American Idol and So You Think You Can Dance, Lythgoe Family Panto produces fun musical theater the whole family can enjoy. Christmas is coming and so is the one and only Moscow Ballet’s Great Russian Nutcracker. Presenting world class Russian artists, hand-painted sets, Russian Snow Maidens, and jubilant Nesting Dolls-Great Russian Nutcracker brings the Christmas spirit to life for all ages. ‘Kids wide-eyed with delight’ says the New York Times. Experience the Dove of Peace Tour, spreading goodwill in over 100 cities across North America. Get seats now for the whole family and make memories for a lifetime at Moscow Ballet’s Great Russian Nutcracker! Tickets are $30-$175 and may be purchased at this link.